Changing Workplaces Review Interim Report released – Join us in our fight for real change! The Workers’ Action Centre has been demanding reform of our outdated labour legislation for years. In the coming months, Workers’ Action Centre will continue working together with many other allies who are leading the Fight for $15 & Fairness campaign to make sure that the final recommendations of this review process, which will be discussed by the Members of Provincial Parliament, are reflective of a commitment to legislate decent working conditions. 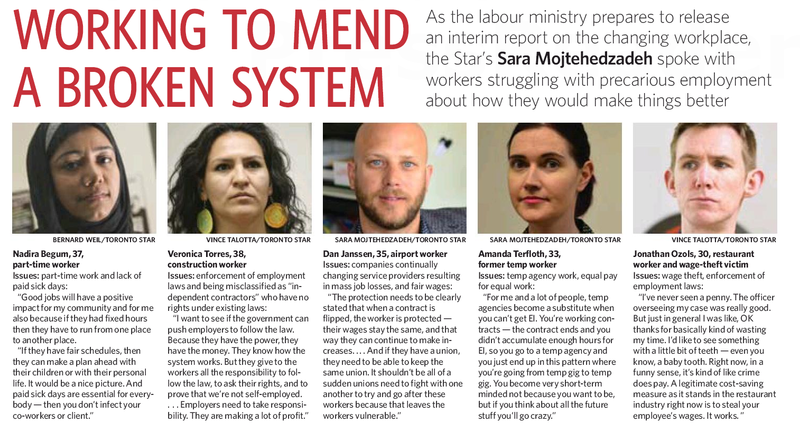 As a recent Toronto Star article featuring workers (some of whom were WAC members) reported, Ontario workers expect big changes to come out of this review to mend our broken labour laws. The Interim Report draws on the submissions received by the Ministry of Labour appointed Special Advisors, as part of the public consultations held across the province during last summer. Many Workers’ Action Centre members had courageously spoken out during these consultations, explaining how wide-spread workers’ rights violations are across sectors and how outdated our laws have become. For our analysis of current labour legislation and our recommendations for change, view our 2015 report, Still Working on the Edge report, which exposes how exemptions and gaps in the Employment Standards Act are giving rise to low wages, insecure work and the erosion of minimum standards.